Don't throw away broccoli stalks... the whole veg, not just the florets, can be used in this 20 minute pasta recipe. 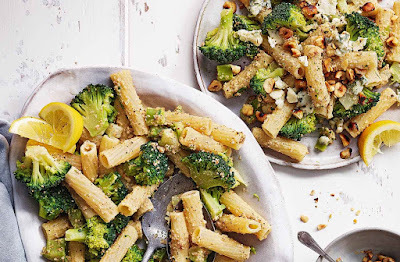 The stalk is blitzed into a vibrant pesto that is stirred through the pasta along with the remaining broccoli, crumbly blue cheese and crunchy hazelnuts. Bring a large pan of water to the boil. Add the broccoli stalks and cook for 8 mins until soft. Drain, then blitz in a food processor with three-quarters of the nuts, half the cheese and the stock until it resembles a smooth pesto. Refill the pan with water and bring to the boil. Add the pasta and cook for 8-10 mins until al dente. Add the florets for the final 2 mins. Drain and return to the pan. Pour over the pesto and stir well to coat; season to taste. Divide between 2 plates and sprinkle over the remaining nuts and cheese. Serve with lemon wedges to squeeze over, if you like.